Are you holding onto the past or feeling guilty about situations and circumstances that have occurred some time ago? Are you walking boldly in this earth or are you holding your head down in shame? If you are a born-again Believer, then you are Righteous and have rights because of your relationship with Jesus Christ. In this powerful series, The Reality of Righteousness, Pastor Winston reveals the importance of being in right standing with God so that your faith flows effortlessly. No longer are you living under the law, but you are under grace.When you awaken to The Reality of Righteousness, you will become a master over debt, sickness, and any other obstacle of the enemy. It is your responsibility to dominate and replenish this earth, to seek and save the lost, and this can only be done by knowing that you are the Righteousness of God in Christ. 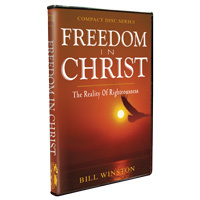 Purchase this powerful teaching today and reign as a king in this earth.